Regulatory changes over the past ten years in checking, transfers, withdrawals and payments by card, together with the arrival of new, nonbank players, have significantly disrupted the classic banking business model for cash management services. What are the current trends in cash management in Europe? Alexandre Bousquenaud, Senior Director, Treasury Advisory: Regulatory changes over the past ten years in checking, transfers, withdrawals and payments by card, together with the arrival of new, nonbank players, have significantly disrupted the classic banking business model for cash management services. Local banks no longer have the resources to respond to changes in the cash management market, and international banks are reviewing their strategies. RBS, for example, has decided to completely withdraw from cash management services. From the business side, the “compensating side-business” approach is on the decline. Treasury departments today tend to concentrate their cash management activities with fewer partners, while reducing the number of bank accounts and more broadly consolidating liquid assets. Has the implementation of the new Basel III prudential regulations marked a strategic inflexion point for banks with regard to cash pooling? As is the case with cash management, banks’ cash-pooling services are constantly evolving. From the standpoint of Basel III, a number of banks provide no notional cash pooling solutions to businesses that do not utilize all or a significant portion of the bank’s cash management services. In contrast, other banks continue to give top priority to selling European cash pooling solutions. For banks that still have an appetite for this pooling activity, the cost of cash pooling structures has not changed significantly. On the other hand, some banks are now demanding that their clients zero out their main accounts in each currency every quarter. Moreover, banks suggesting consolidation accounts in London are now considering alternative solutions in Amsterdam, in anticipation of potential restrictions relating to Brexit. Have cash management service products now become pan-European, nearly ten years after adoption of the payment services directive issued by the SEPA? According to Redbridge’s recent banking consultations, the cost of cash management in Europe averages 0.02% of revenue for B2B corporates, and 0.35% of revenue for B2C. These estimates largely depend on the country and the types of transactions in question. Despite the SEPA and recent regulatory changes, particularly the changes to electronic banking activities in Europe, many specific local requirements remain (proportional costs, online costs, etc.). US banks widely present in Europe as subsidiaries of major US parent companies are not hesitating to apply certain domestic US bank practices. For example, US banks are applying ECR (Earnings Credit Rate), which offsets a portion of the cash management bill in exchange for leaving certain levels of balances in demand deposit accounts, to European based accounts. The European market is evolving so quickly that we advise our clients to review their cash management bank pricing every three years. The SEPA and electronic flows have truly driven the price of cash management services downward. Renegotiating bank pricing agreements may still yield additional savings, often significant enough to completely cover the implementation of a bank cash pooling service or to deploy a TMS cash pooling capability internally. What other cash management optimization opportunities are available to enterprises? Based on our observations, between 5% and 10% of total cash management expenses deducted from business accounts are unwarranted. Very few regional banks today are capable of providing electronic bank billing reports. 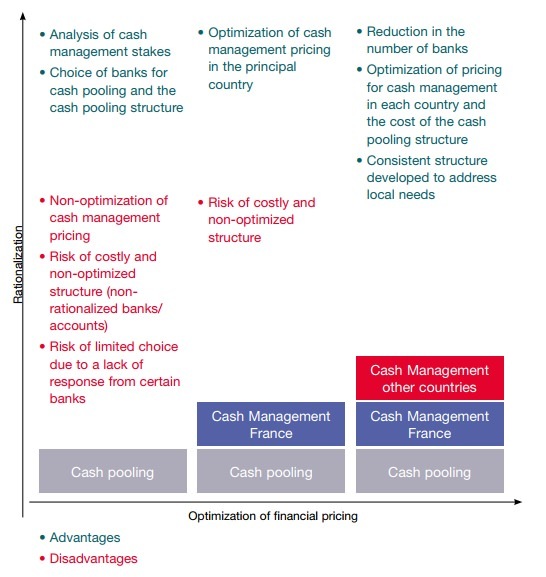 Consequently, it is extremely difficult to gain an accurate view of cash management volumes and costs in Europe. We strongly advise our clients, in order to control those expenses better, to ask their banks (international and local) for a bank service billing report in camt.086 format. The availability of this report is an increasingly important criteria for selecting future cash management banking partners.